Punkbuddhaz refers to creativity and philosophy. This would be your eyes to inspect upon some worldly matter with a different prospective. The matters might be some stories with deep subconscious meanings or it might be some philosophic ideas with discussions. Such thoughts would be dissected and analyzed to reach the bottom of the truth. there would also be some short stories too. There would be short movies, stories, poems, photographic works, and many more things to represent a certain idea for the transformation of the society and the world towards truth and reality. Here in the U.S., democracy is often viewed as synonymous with freedom, elections and equality. But to other countries worldwide, especially those governed by dictators, democracy is seen in some odd ways: as a glass of water, a smoothie or a pigeon. For instance, the video submitted by Akash Mohimen of India shows a set of dominoes to illustrate the effect of a village election. In the end, democracy is “when power is at your fingertips,” Mohimen said in the video. The contest rules are simple: Create a video that completes the phrase, “Democracy is …” Contestants had to make sure that their video is no longer than three minutes, has English subtitles and is uploaded onto YouTube. “The submissions clearly tell us the challenges to democracy other countries face. That entry from Ghana shows us that corruption is endemic,” said Jean Rogers, deputy director of programs for the Center for International Private Enterprise. George Clack, the State Department director pf publications who has seen all 900 videos, said he was struck by how nondemocratic countries responded to the challenge. “They take it more seriously than Americans did,” he said. In an entry from Nepal, Bigyan Dixit used a tray of eggs to illustrate how far each country has progressed in obtaining democracy. The egg named Afghanistan, for example, is untouchable. The egg named Iraq has a dead chick in it. And the egg named America has a chick. “Democracy is a pigeon … let it be free in the sky,” Dixit said in the video. The 21 finalists will be announced Friday. 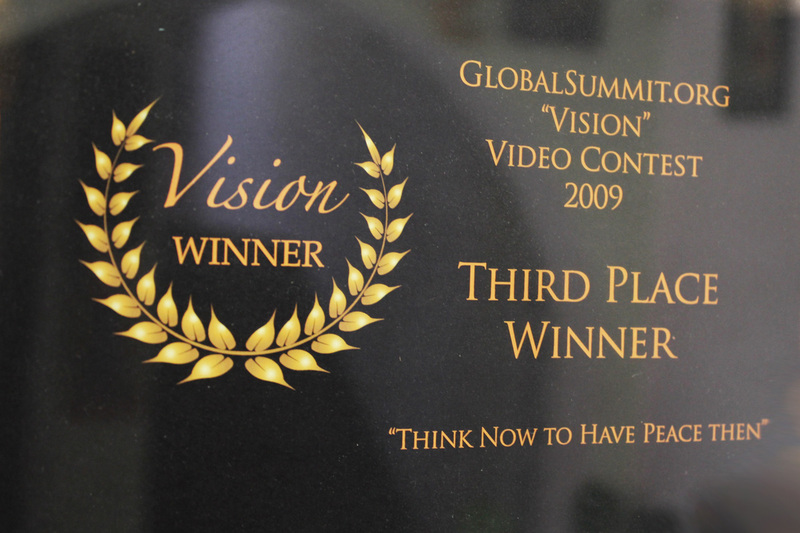 Six grand winners will be selected from sub-Saharan Africa, East Asia and the Pacific, the Near East and North Africa, South and Central Asia, the Western Hemisphere, as well as one anonymous video. Margolis said they decided to include an anonymous video category so “we won’t jeopardize the safety” of the participants. Winners will receive a trip to New York, Hollywood and Washington, D.C.
After the success of his short film Basna Ko Sikar in 2009, young director Bigyan Dixit has created a stir with his films at international film competitions. Out of the six international film competitions he has participated in, his films– Basna ko Sikar (8mins), Democracy video for 2009(3mins), Think now to have peace Then ( 3mins) and Back to my mother ( 60 sec)– have been successful at four competitions like the Global Summit, USAID, American Embassy and Eyeka Film Competition. Apart from this, his films Dreams come true (60 sec) and http://www.virus.us have also been appreciated. 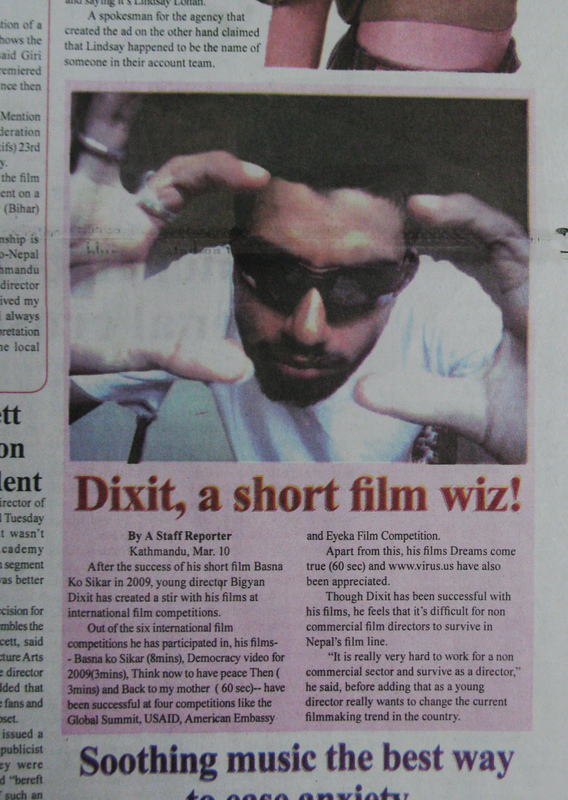 Though Dixit has been successful with his films, he feels that it’s difficult for non commercial film directors to survive in Nepal’s film line. “It is really very hard to work for a non commercial sector and survive as a director,” he said, before adding that as a young director really wants to change the current filmmaking trend in the country. 2010 © Gorkhapatra.org All rights reserved. 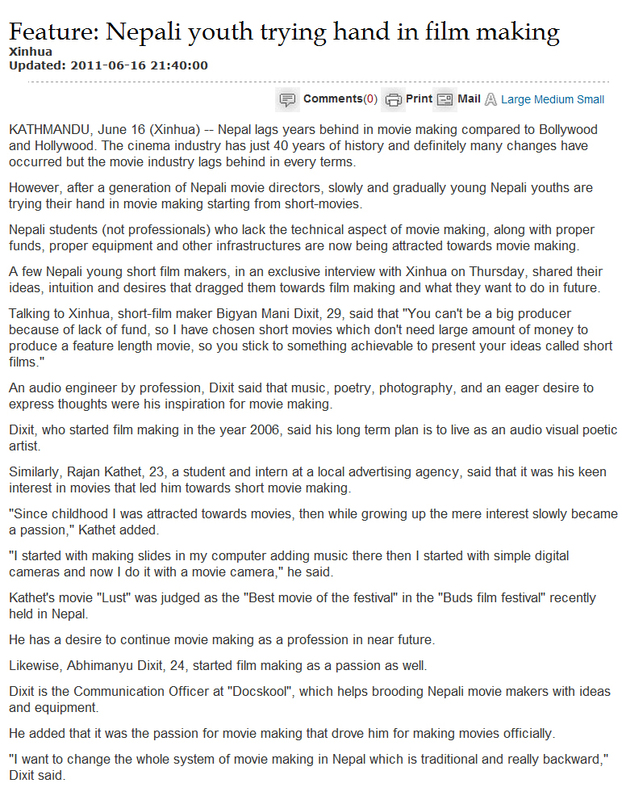 Nepal, March 17 — The history of the Nepali film industry cannot be compared to the likes of Bollywood and Hollywood. Though the first film, Satya Harischandra, was released in 1951, in the last few decades, the Nepali film industry has not developed as expected or hoped, particularly in content and originality. But with a new trend of short films and film festivals, new ideas are breaking the monotony and the best place to experiment with your own ideas may be the ultra-low budget short films. A short film is defined as a film with duration of less than an hour, and is also an artistic medium of expression. Bigyan Mani Dixit is one such filmmaker, who has already directed six films, four of which have won international prizes. Despite studying engineering, he confesses to being an artist, who has had an interest in music, art and poetry since his childhood days. “I started making short films in 2006. The artistic freedom that allows me to create something new and experimental inspired me to become a director.” He has directed and produced six short films- Basna Ko Sikar (8 minutes),The Undefinable (3 minutes), Think Now To Have Peace Then (3 minutes), Back To My Mother (60 seconds), Dreams Come True (60 seconds) and HIV-AIDS Protection (30 seconds)-all of which have been screened internationally. The screening of The Undefinable at the Democracy Video Challenge Contest organised by the U.S. Embassy received very positive feedbacks. Dixit is now planning to make a film entitled the Indigenous Raute People, based on the lives of the Raute, the only nomadic ethnic group of Nepal. He is planning the movie to bring more tourists in the Visit Nepal Year 2011. 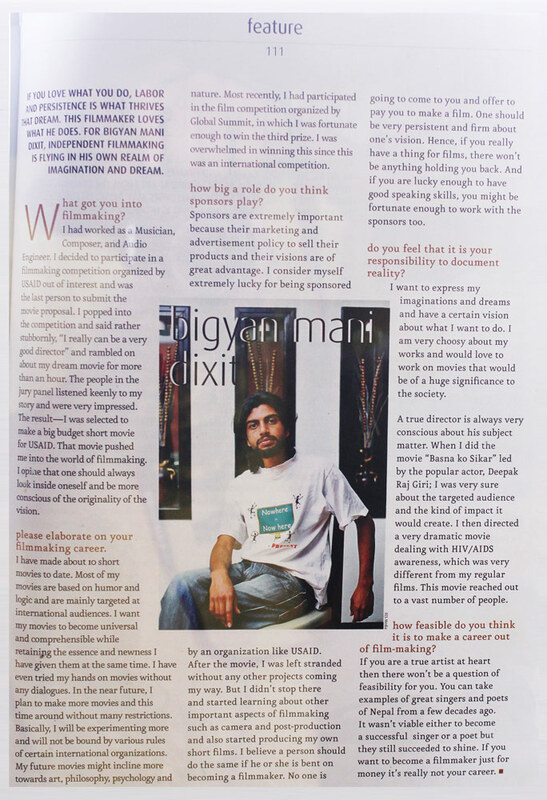 According to Bigyan Mani Dixit, even people with no background in filmmaking are capable of becoming good directors if they are creative. “Studying in a film school won’t make you a good actor or director. You must dare to try out something new and experimental,” he said. In the 25th year of the Internet, the medium has become an extremely effective way to broadcast one’s film worldwide. Just go out there, shoot, and let your creativity fly. 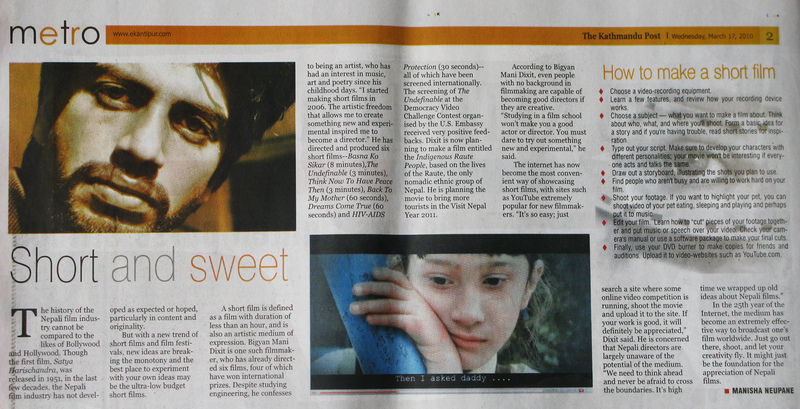 It might just be the foundation for the appreciation of Nepali films. This is a paper cut from Rising Nepal interview. It was one of the oldest interview may be right after making the USAID project. Ecs Living April Issue !! !